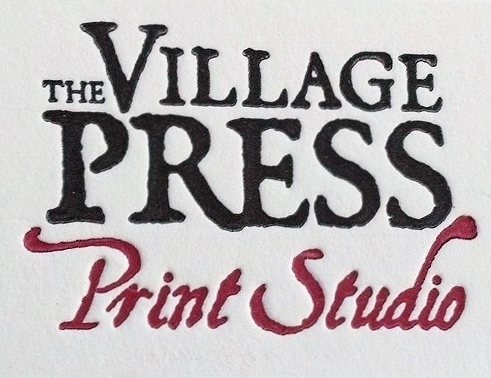 The Village Press Print Studio is an art and printmaking space dedicated to creative learning and artistic activities of all kinds. The modest (but adequately equipped) non-toxic studio has two etching presses – one that is 24″x60″ and one 14″x36″. Eventually, there will also be a screen press. The studio also offers an Amergraph UV exposure unit for the polymer photogravure etching process. We have added letterpress equipment and foundry type to our printing arsenal. We have two 8×12 Oldstyle Chandler and Price platen presses, a Vandercook SP-15 proof press, a Vandercook No. 4 proof press, a 6.5×10 C&P Pilot tabletop platen press and two Kelsey tabletop presses – a 3×5 and a 6×9. With ample, light-filled classroom space for 6-8 students, the studio offers printmaking and letterpress classes and special event workshops. The studio is available for rental to artists with printmaking or letterpress experience. Contact Laurie@villagepressprintstudio.com or 575.418.6431 if you would like more information.